The Pico-Light design aims to be the smallest, lightest trailer that can sleep two people. It is even smaller than a ‘normal’ 8ftx4ft teardrop and doesn’t have a galley or any cupboards. However its size and weight make it suitable for the smallest tow vehicles, including large motorcycles. A detailed weight estimate suggests an empty weight of 280 pounds. This design was inspired by the Eis Piccolo made in Germany in the 1950s and that explains the ‘Pico’ in its name. Some may also recognise that Pico- is the prefix for a very small measure - it means 10^ -12. The body is all single-skin and uses 1/8” ply for the roof, 1/4” for the sidewalls and 3/8” for the floor. Although the body is very lightly-built, it is self-supporting so only an extremely basic triangular frame is needed for the chassis and more weight is saved by using separate half-axles with 8” wheels. The PDF plans are fairly comprehensive with every part shown and the 3D model is available in zipped DXF format for CAD users. For SketchUp users, a SKP model is available but even zipped it is 3.5Mbyte, so please email me to be sent a copy. Warning: this trailer design has not been prototyped and prospective builders need to satisfy them-selves that it is large enough for their needs (and their claustrophobia…). 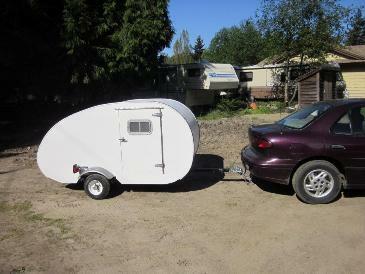 This design is one size smaller than even a normal 8ft teardrop. Building a mock-up of the sleeping space in cardboard and trying it out would be sensible. Update: Sandy in British Columbia has built a Pico-Light, although he stretched his to an 8ft length, and he reports that all went well. Best of all, he reckons he only loses 5% fuel economy when towing it behind his compact. 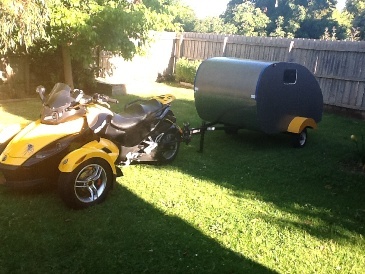 And Chris in Victoria, Australia has built himself a Pico-Light, to tow behind his Can-Am Spyder, which he reports it does well.. Chris has also changed the shape a bit.